Boxing is a combat sport where two participants, generally of similar weight, fight each other with their fists. Boxing is supervised by a referee and is typically engaged in during a series of one to three-minute intervals called rounds. There are three ways to win. Victory is achieved if the opponent is knocked down and unable to get up before the referee counts to ten seconds or if the opponent is deemed too injured to continue . If there is no stoppage of the fight before an agreed number of rounds, a winner is determined either by the referee's decision or by judges' scorecards. In some countries with their own fighting sports, the sport is referred to as "English Boxing There are numerous different styles of boxing practiced around the world. Boxing does not allow kicks like the styles above. Fist fighting depicted in Sumerian relief carvings from the 3rd millennium BC, while an ancient Egyptian relief from the 2nd millennium BC depicts both fist-fighters and spectators. Both depictions show bare-fisted contests. In 1927 Dr. E. A. Speiser, an archaeologist, discovered a Mesopotamian stone tablet in Baghdad, Iraq depicting two men getting ready for a prize fight. The tablet is believed to be 7,000 years old. Fist-fighting or boxing is also described in several ancient Indian texts such as the Vedas, Ramayana and Mahabharata. Evidence was also found in excavations at the Indus Valley cities of Mohenjadaro and Harappa. The earliest evidence for fist fighting with a kind of gloves can be found on Minoan Crete (c. 1500–900 BC), and on Sardinia, if we consider the boxing statues of Prama mountains . The lebo and the Etruscans called boxing pugilism . The Greeks and Etruscans were not the first to give rules to the sport, if we consider Mediterranean peoples who preceded them, such as the Shardana and the Egyptians. In the Mediterranean area while clinching was strictly forbidden, there were (unlike in modern boxing) no weight classes. Fights were not separated into rounds and had no time limit. They ended at a knockout, or at a fighter abandoning the fight, or sometimes at the death of one of the fighters. Although gloves were used in practice, in competition fighters wrapped their hands in strips of hardened leather which protected the fist and caused unpleasant injuries for the opponent. Homer's Iliad contains the first detailed account of a boxing fight According to the Iliad, Mycenaean warriors included boxing among their competitions honoring the fallen though it is possible that the Homeric epics reflect later culture. Another legend holds that the heroic ruler Theseus, said to have lived around the 9th century BC, invented a form of boxing in which two men sat face to face and beat each other with their fists until one of them was killed. In time, the boxers began to fight while standing and wearing gloves and wrappings on their arms below the elbows, although otherwise they were competed naked. 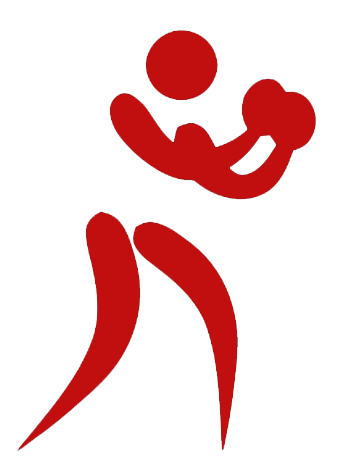 Boxing was first accepted as an Olympic sport in 688 BC, being called Pygme or Pygmachia. Participants trained on punching bags . Fighters wore leather straps (called himantes) over their hands, wrists, and sometimes breast, to protect them from injury. The straps left their fingers free. Legend had it that the Spartans were the first to box as a way to prepare for sword and shield fighting. In ancient Rome, there were two forms of boxing both coming from Etruscan boxing. The athletic form of boxing remained popular throughout the Roman world. The other form of boxing was gladiatorial. Fighters were usually criminals and slaves who hoped to become champions and gain their freedom; however, free men, women, and even aristocrats also fought. Gladiators wore lead "cestae" over their knuckles and heavy leather straps on their forearms to protect against blows. The deeply scarred and cauliflower eared figure of the Boxer of Quirinal show what a brutal sport it could be (matches often ending in the death or maiming of an opponent). In 393 A.D., the Olympics were banned by the Christian emperor Theodosius, and in 400 A.D., boxing was banned altogether by Theodoric the Great as boxing being an insult to God because it disfigures the face, the image of God. However, this edict had little effect outside the major cities of the Eastern Empire. By this time, western Europe was no longer part of the Roman Empire. Boxing remained popular in Europe throughout the Middle Ages and beyond. Wrestling, fencing and racing (both chariot and foot) were never banned by the late Romans, as they did not cause disfigurement.